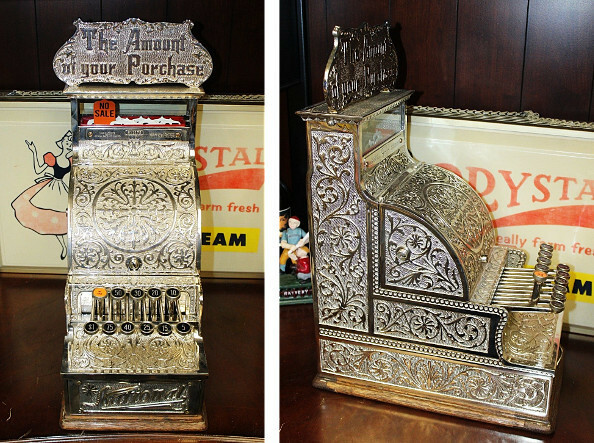 Antique cash registers are incredibly beautiful things; they’re fully fledged works of art. 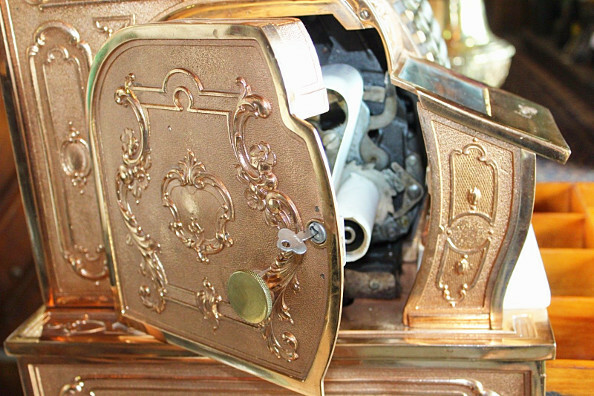 Cash registers were made from copper, brass, nickel, mahogany, silver, and even gold. Their history is very fascinating. In the middle of the 19th century, due to the Industrial Revolution, trades flourished, sales and money turnover increased, and the need for accurately calculating revenue grew. During these times, there were no special machines which could record sales and cash income. 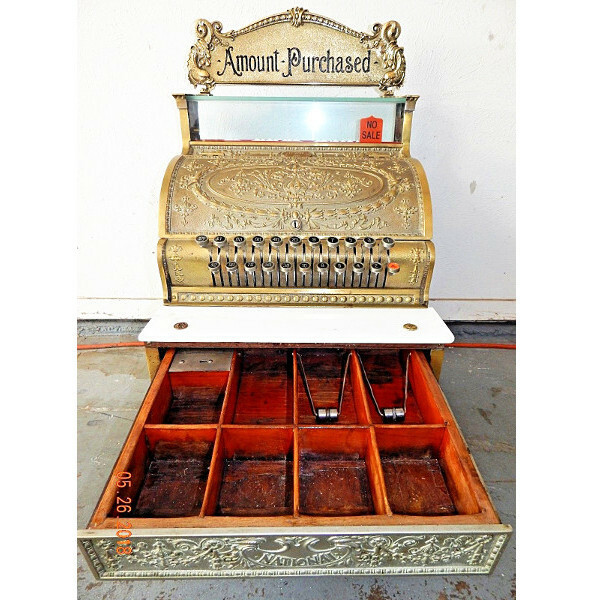 Almost all retail stores were using a cash drawer with sections for banknotes and coins, which helped to manage cash. 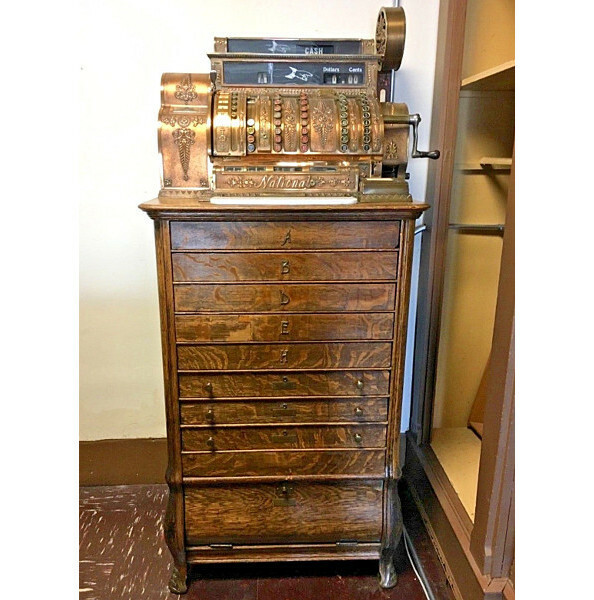 This was perhaps the only trading equipment that was in the store at that time, except for the abacus. In 1879, James Ritty, a saloonkeeper from Dayton, Ohio invented the first cash register, which prevented employees from stealing cash revenue. Once they invented the device, they patented it as ‘Ritty's Incorruptible Cashier’. At this moment, a new era in the retail business began. Upon patenting ‘Incorruptible Cashier’, Ritty opened a small factory in Dayton and started to manufacture the cash registers. 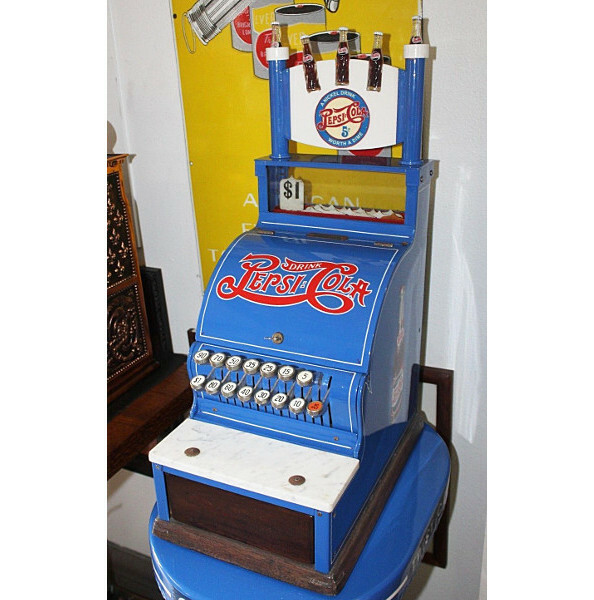 His company was named ‘James Ritty's New Cash Register and Indicator’. But James didn't have time to manage two businesses simultaneously, and the cash register business was not successful. 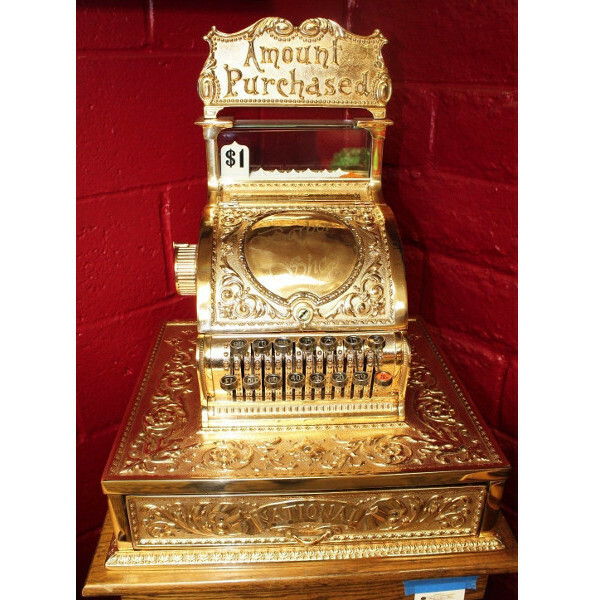 Eventually, in 1881, he sold the cash register business including patents to Jacob Eckert for $1,000. 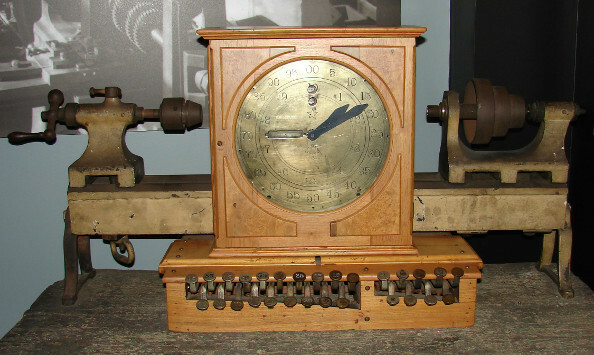 Eckert established the 'National Manufacturing Company' and began to manufacture the cash registers more intensively. The company made some improvements to Ritty’s machine, which globally determined the future of cash registers’ design and practices. He equipped the register with a cash drawer and a bell. During the purchase, the cash drawer opened, the bell rang and forced the cashier to deposit the money received and to pay out the change. Incessant sound of the bell in a store showed that the business was going well. Around this time, John H. Patterson, a retail business owner, heard about Ritty’s incredible machine that registered sales. He bought two pieces for his stores. John and his younger brother Frank were operating three coal mines and a chain of retail stores. Their stores had the same problem as James Ritty saloon – employees were stealing money from their stores and suffered losses for several years. After acquiring the new cash registers, his stores showed a profit of several thousand dollars within the first six months. John Patterson was so impressed with the results. Here stated, "We were obliged to be away from the store most of the time so we employed ﻿a superintendent. At the end of three years, although we had sold annually about $50,000 worth of goods on which there was a large margin, we found ourselves worse off than nothing. We were in debt, and we could not account for it, because we lost nothing by bad debt and no goods had been stolen. But one day I found several bread tickets lying around loose, and discovered that our oldest clerk was favoring his friends by selling below the regular prices. Another day I noticed a certain credit customer buying groceries. At night, on looking over the blotter, I found that the clerk had forgotten to make any entry of it. This set me to thinking that the goods might often go out of the store in this way-without our ever getting a cent for them. One day we received a circular from someone in Dayton Ohio, advertising a machine which recorded money and sales in retail stores. The price was $100. We telegraphed for two of them, and when we saw them we were astonished at the cost. They were made mostly of wood, had no cash drawer, and were very crude. But we put them in the store, and, in spite of their deficiencies, at the end of twelve months we cleared $6,000." In 1883, John with his brother decided to invest money in The National Manufacturing Company and bought all of the newly issued company stocks. By then, John and Frank had gone out of the coal business. In 1884, when John became the owner of most of the company shares (227 of 300), he decided to change the company name to the 'National Cash Register Company'. Unlike James Ritty who failed in the cash register business, Patterson believed that if he can convey to shop owners about what benefits such a machine could give to their business, they'll be selling very well. To ensure that, he created a sales team known as the "American Selling Force" which worked on commissions and followed a clear sales instructions called the "N.C.R. Primer. ", its philosophy was to sell features rather than just a piece of machinery. National Cash Register model class 500 (1914). It had multiple cash drawers and was designed for big restaurants. 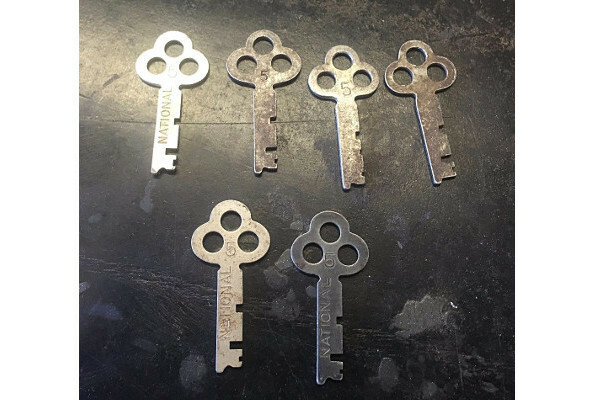 Machine outfits with 4 keys and 2 special control keys. Four holes were designed for a personal key of each waiter. When the waiter put the key and the charge amount, only one drawer opened with a letter A, B, D, or E. Two control keys were intended for the administrator and elder manager for checking the amount when they closed the shift. Also, the back cover had a 'secret' – when the key rotated, the internal counter noted how many times the drawer opened. 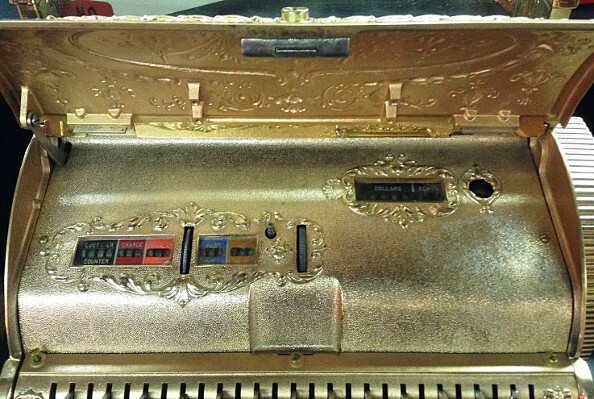 National Cash Register model 52 (golded). Designed for barbershops. 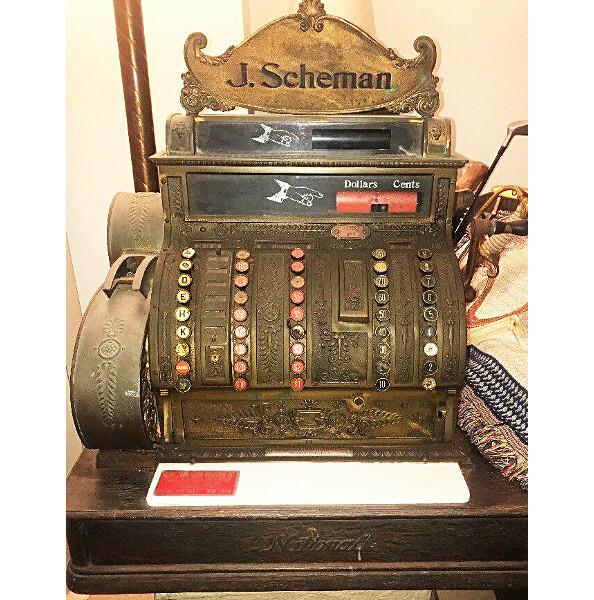 Time passed, and cash registers were implemented in almost all stores in the US. They became popular not only in the USA but worldwide. 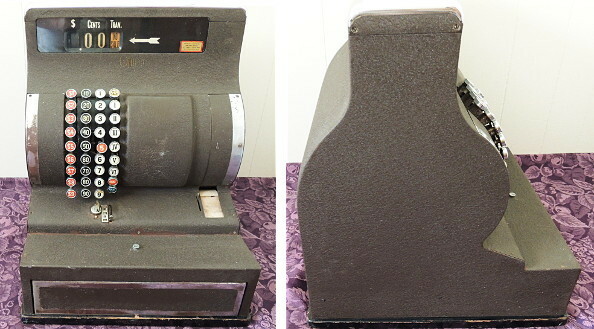 National Cash Register model 452 with a personal marquee. Copper. 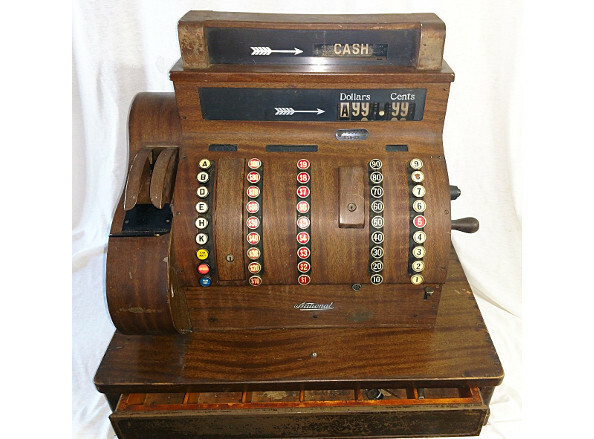 Between 1888 and 1895, there were 48 companies in the US who sold cash registers, but only four survived – National Cash Register (NCR), St. Louis, Ideal, and Michigan. NCR was undisputedly the leader among them, having 95% of the market share in 1915. National Cash Register model 1064G (1911) with a printer. Brass. National Cash Register model 144. Decorative silver plates. ￼From 1889 to 1912, 1 million cash registers were released by NCR alone. And by 1916, 1,5 million. National Cash Register model 332 (1912). Brass. By recording every sale, cash registers made it difficult for devious employees to steal cash. But shop owners did not buy them only for this purpose. Cash register machines also kept track of daily sales and helped to do the accounting and inventory management. The purchase registration was becoming more and more automated. Then one day, Patterson made a new breakthrough – he invented a device which printed the receipt for the customer. In 1906, Charles F. Kettering, the NCR engineer, designed the cash register with an electric motor. The model, named 'Class 1000', has been successful and remained in production, with minor changes, for more than 40 years. 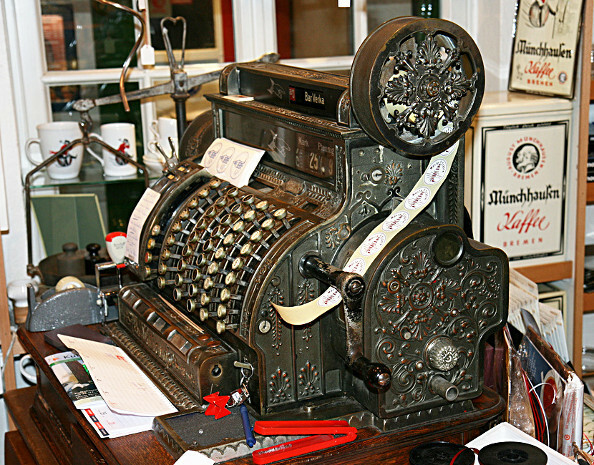 World War I marked the end of the era of vintage cash registers. Wonders of mechanics no longer fascinated people. Also, manufacturers were no longer interested in making expensive metal plates, covered with decorative patterns. 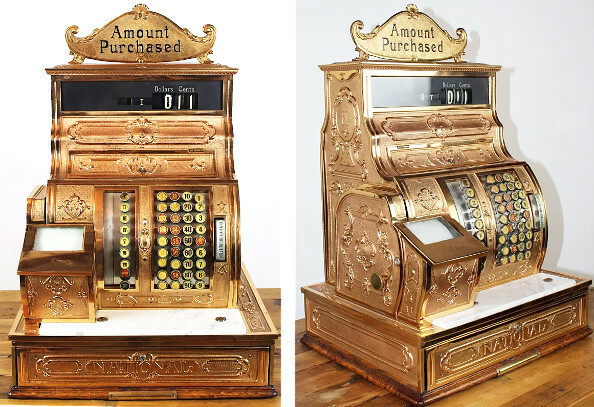 Finally, beautiful brass and copper cash registers had gotten old-fashioned. 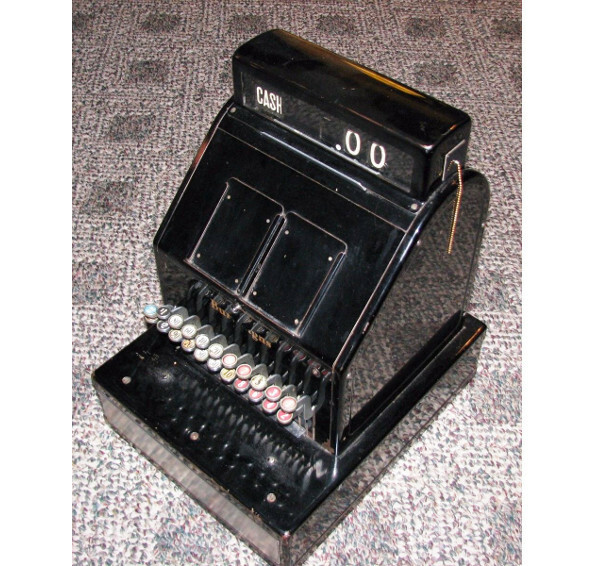 National Cash Register model 852. Wood. During the new period, functionality and usability have been brought to the fore. Thanks to that, cash registers became cheaper and more accessible for small businesses, which further encouraged its sustained economic growth. The James Ritty’s invention helped many business owners to grow their business and made many people millionaires. His invention is still very popular to this day. Although POS software for iPad, Android, and Windows replaced the electronic and mechanical cash registers, the core essence of ‘Incorruptible Cashier’ has remained the same. 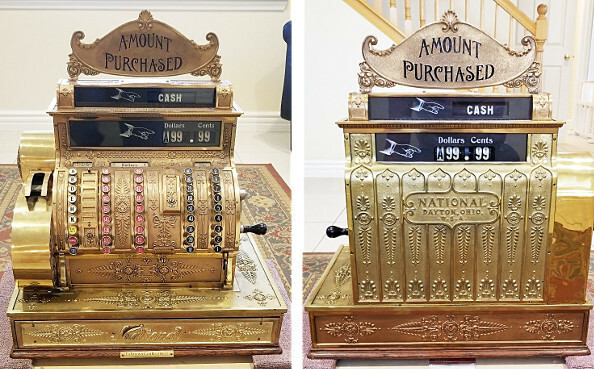 Nowadays these vintage machines serve as museum pieces or store's elements of decor and have value as collectors' items. 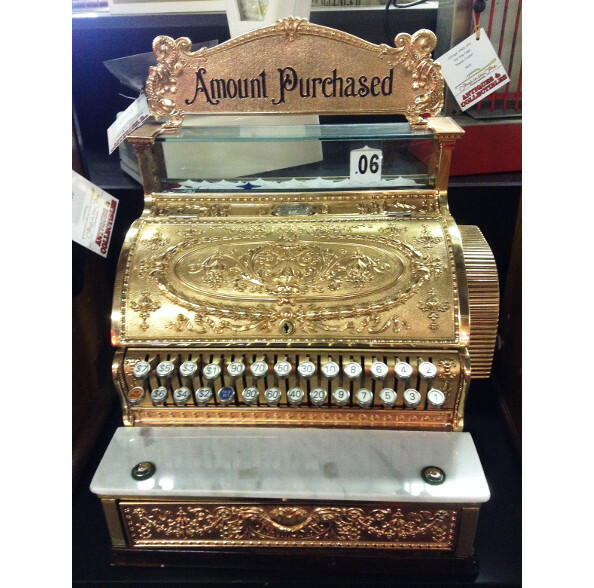 But some creative store owners still use old cash registers for their proper purpose – to register cash income. It is funny and fascinates. Entrepreneurs of all time were thinking how to prevent employee theft. Thank you, it was interesting. How to make multiple registers draw stock from single store? Does Loyverse POS support ethernet cash drawers such as the APG T470-BL1616?